During the early development period, the home computer era began in earnest in the form of the TRS-80, Commodore PET, and Apple II family—what Byte Magazine would dub the "1977 Trinity". Nolan Bushnell sold Atari to Warner Communications for $28 million in 1976 in order to raise funds for the launch of the 2600. Warner had recently sent Ray Kassar to act as the CEO of the company. Kassar felt the chipset should be used in a home computer to challenge Apple. In order to adapt the machine to this role, it would need to support character graphics, include some form of expansion for peripherals, and run the then-universal BASIC programming language. Management identified two sweet spots for the new computers: a low-end version known as "Candy", and a higher-end machine known as "Colleen" (named after two Atari secretaries). The primary difference between the two models was marketing; Atari marketed Colleen as a computer, and Candy as a game machine or hybrid game console. Colleen included user-accessible expansion slots for RAM and ROM, two 8 KB ROM cartridge slots, RF and monitor output (including two pins for separate luma and chroma, allowing a complete S-Video output) and a full keyboard. 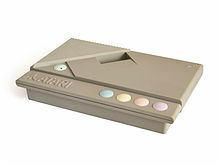 Candy was initially designed as a games console, lacking a keyboard and input/output ports, although an external keyboard was planned that could be plugged into joystick ports 3 and 4. At the time, plans called for both to have a separate audio port supporting cassette tapes as a storage medium. 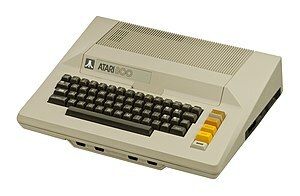 Despite planning an extensive advertising campaign for 1980, Atari found competing with microcomputers from market leaders Commodore, Apple, and Tandy difficult. By mid-1981 it had reportedly lost $10 million on sales of $10-13 million from more than 50,000 computers. Announced with a $1000 price, the 1200XL was released at $899. This was $100 less than the announced price of the 800 at its release in 1979, but by this time the 800 was available at much lower price points. Considered as a whole, the differences between the 1200 and earlier machines was minor, or even retrograde. We're hard pressed to figure out what Atari is up to ... We're concerned about the emperor's new clothes because the actual features of the XL seem off base when compared to the competition. For example, the Atari 800[, less than $700] ... we're concerned that the 1200XL has been introduced to fill a nonexistent hole in Atari's product line. If it had been announced at $499 instead of $899, it would have been a welcome addition to the Atari computer line... The 1200 has met with nearly universal insouciance in the microcomputer community, and for good reason. It has an extra 16K in a designer case, without a right cartridge slot, expansion slots, or a third and fourth controller jack. It has no standard parallel or RS-232 ports. Only substantive price cuts will help its image in any tangible way. So how do I rate the 1200XL in overall features and performance? Quite honestly, it depends entirely on what the price of the machine is. At anything under $450, it's a terrific bargain ... it should be able to sell for half the cost of the 800. However, the indications are that the price of the 800 will be dropped and that the 1200 will cost more than the 800. If so, buy an 800 quick! There is an often-repeated story, perhaps apocryphal, that 800 sales rose after the release of the 1200XL, as people bought them before they disappeared. By mid-1983 the computer was sold for $600-700. It was discontinued in June 1983. There was no PAL version of the 1200XL. In May 1981, the Atari 800's price was $1,050, but by mid-1983 it was $165 and the 400 was under $150. Although Atari had never been a deliberate target of Tramiel's wrath, the Commodore/TI price war affected the entire market. The timing was particularly bad for Atari; the 1200XL was a flop, and the earlier machines were too expensive to produce to be able to compete at the rapidly falling price points. Atari had difficulty in transitioning manufacturing to Asia after closing its US factory. Originally intended to replace the 1200XL in mid-1983, the new models did not arrive until late that year. Although the 600/800 were well positioned in terms of price and features, during the critical Christmas season they were available only in small numbers while the Commodore 64 was widely available. Brian Moriarty stated in ANALOG Computing that Atari "fail[ed] to keep up with Christmas orders for the 600 and 800XLs", reporting that as of late November 1983 the 800XL had not appeared in Massachusetts stores while 600XL "quantities are so limited that it's almost impossible to obtain". Although the 800XL would ultimately be the most popular computer sold by Atari, the company was unable to defend its market share, and the ongoing race to the bottom reduced Atari's profits. Prices continued to erode; by November 1983 one toy store chain[which?] sold the 800XL for $149.97, $10 above the wholesale price. After losing $563 million in the first nine months of the year, Atari that month announced that prices would rise in January, stating that it "has no intention of participating in these suicidal price wars". The 600XL and 800XL's prices in early 1984 were $50 higher than for the Commodore VIC-20 and 64, and a rumor stated that the company planned to discontinue hardware and only sell software. Combined with the simultaneous effects of the video game crash of 1983, Atari was soon losing millions of dollars a day. Their owners, Warner Communications, became desperate to sell off the division. Production timeline dates retrieved from Atari 8-Bit Computers F.A.Q., and Chronology of Personal Computers. The third custom support chip, named POKEY, is responsible for reading the keyboard, generating sound and serial communications (in conjunction with the PIA chip (Peripheral Interface Adapter, 6520) commands and IRQs, plus controlling the 4 joystick movements on 400/800 and later RAM banks and/or ROM(OS/BASIC/Self-test) enables for XL/XE lines). It also provides timers, a random number generator (for generating acoustic noise as well as random numbers), and maskable interrupts. POKEY has four semi-independent audio channels, each with its own frequency, noise and volume control. Each 8-bit channel has its own audio control register which select the noise content and volume. For higher sound frequency resolution (quality), two of the audio channels can be combined for more accurate sound (frequency can be defined with 16-bit value instead of usual 8-bit). The name POKEY comes from the words "POtentiometer" and "KEYboard", which are two of the I/O devices that POKEY interfaces with (the potentiometer is the mechanism used by the paddle). The POKEY chip—as well as its dual- and quad-core versions—was used in many Atari coin-op arcade machines of the 1980s, including Centipede and Millipede, Missile Command, Asteroids Deluxe, Major Havoc, and Return of the Jedi. F 9 64/80/96 1 32/40/48 16* 2 16 shades of the background color. F 11 64/80/96 1 32/40/48 16* 2 15 color hues all in the same luminance specified by the background color register, though the background color is black. ^ No cash was required, instead Warner had the right to purchase $240 million in long-term notes and warrants, and Tramiel had an option to buy up to $100 million in Warner stock. ^ a b Alcorn 2015, 17:00-17:30. ^ Goldberg & Vendel 2012, p. 455. ^ Goldberg & Vendel 2012, p. 456. ^ Goldberg & Vendel 2012, p. 460. ^ a b Goldberg & Vendel 2012, p. 466. ^ Levy 1984, pp. 260-261. ^ Goldberg & Vendel 2012, p. 698. ^ Polsson, Ken (April 3, 2014). "Chronology of Personal Computers". p. 1978. Retrieved February 5, 2015. ^ Goldberg & Vendel 2012, p. 526.